This week, Meghan of Voilà! posted a style challenge that I found particularly intimidating: “Borrowed from the Boys”. I’m pretty much the exact opposite of a tomboy. Sure, as a kid I loved climbing trees and pretending I was a great explorer or detective… but I also adored pink and purple and wanted to be a princess. And my fashion choices have always reflected those more feminine leanings. Anyway, while I really like seeing other people successfully incorporate masculine touches into their outfits (Santina of Style by Santina, one of this week’s challenge participants, is particularly awesome at mixing masculine & feminine elements in her outfits), I’m generally not comfortable doing it myself. So here I am, in one of my rare moments wearing pants, rocking a replica of Will Clark’s 1989 grey road jersey from the Bay Bridge World Series. … but as you can see, I still wore kitten heels: sparkly silver ones that mirrored the silver grey of the jersey. 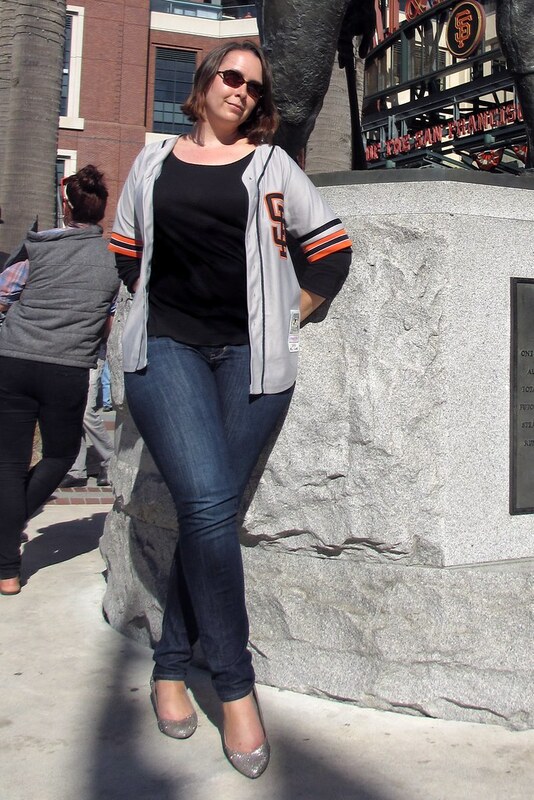 Of course, I had to have my photos taken at AT&T Park, in front of Willie Mays’s statue. 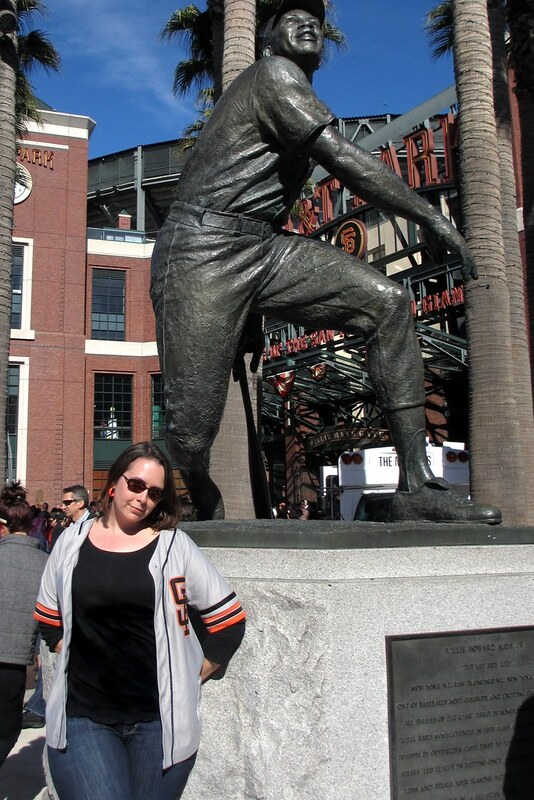 Posing with Willie Mays at AT&T Park. Photo by Pat Zimmerman. I’ve been itching to wear this Bettie Page dress ever since it arrived in the mail last week, and decided it would work for today’s challenge. The dress might look a little familiar, because it’s the same pattern as another Bettie Page dress I previously posted about. I just loved the silhouette so much that I couldn’t resist buying the new colorway! Anyway, to play up the ladylike theme, I paired it with black pearls and a pashmina (layers are pretty much always necessary in San Francisco). 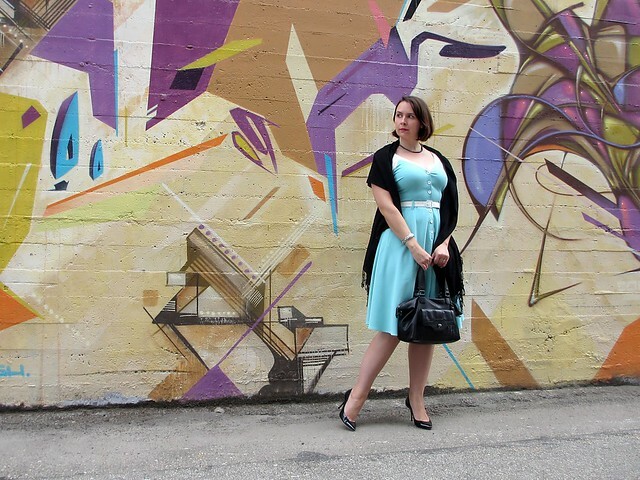 And I added black patent leather heels… then posed in front of a mural. Nothing says “ladylike” like street art! Don’t you think? Aloha! It’s Friday, which means another style challenge! The theme this week is neon. 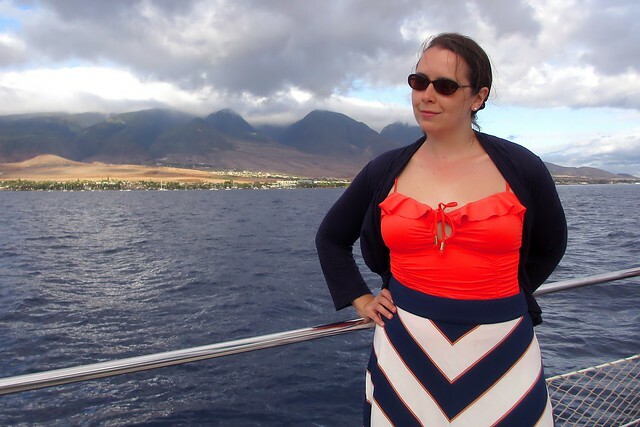 And where better to wear neon colors than on a sunset cruise? Neon and navy, with my soon-to-be-lost plumeria blossom. Photo by Pat Zimmerman. 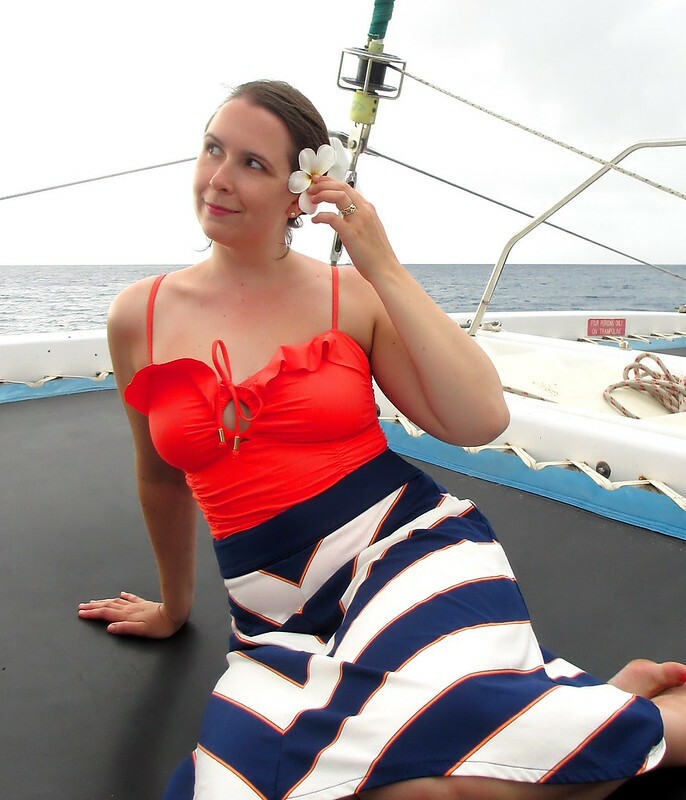 I grabbed this bathing suit at a super-tropical store: Old Navy. 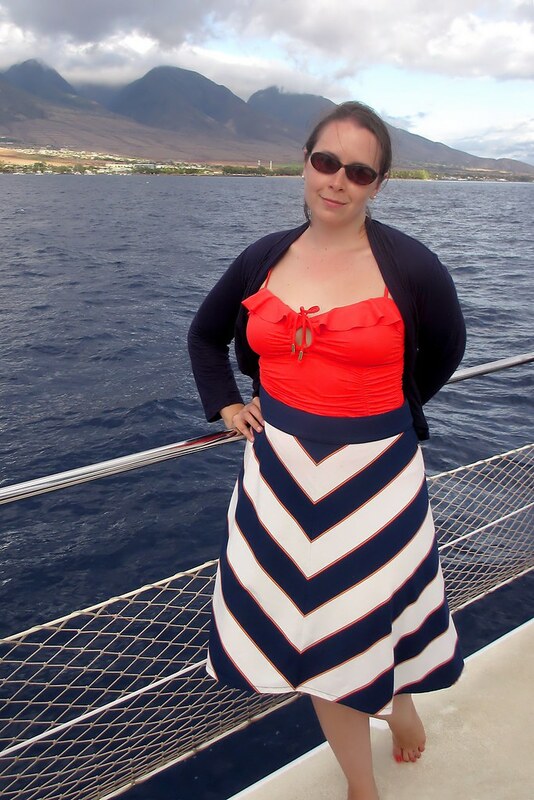 And I paired it with a jersey knit chevron-striped skirt and a jersey knit navy cardigan when the breezes picked up. Plus a pair of pearl earrings. The effect was tropical meets nautical – which meshed well with the scenery! This week I participated in a style challenge! The theme was summer hats. My hat of choice? A fancy, Melbourne Cup / Kentucky Derby style hat in bold orange, with orange and crème colored feathers. 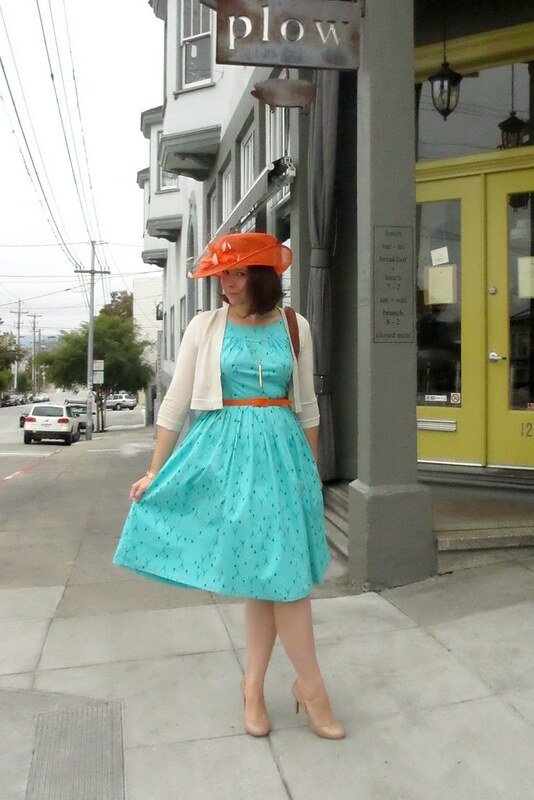 I paired it with my newest Bettie Page dress – it’s aqua with orange accents, and printed with Eiffel Towers and fleur de lis. And I love the fun detail in the back! 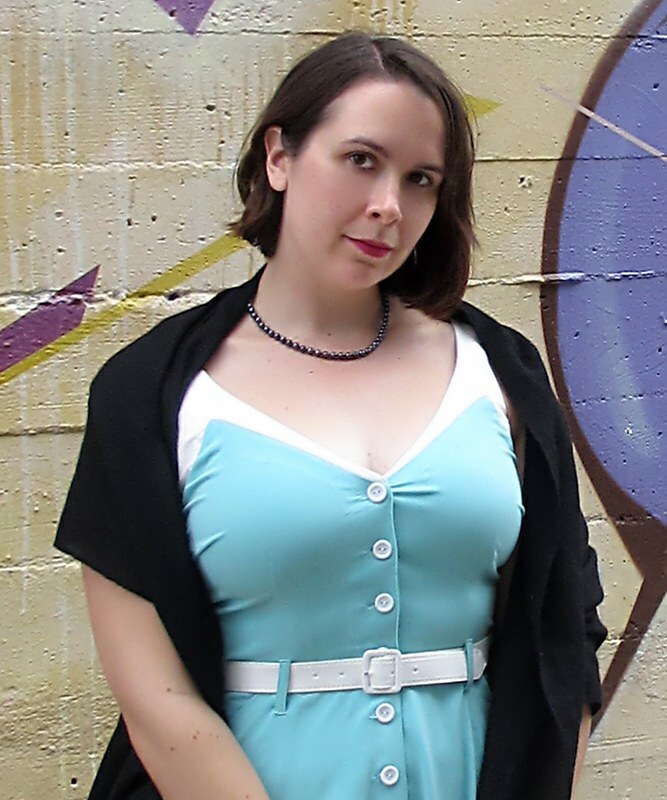 Alas, the weather in San Francisco in the past couple of days has been less-than-summery, so I had to add a cardigan. (The eternal story of SF “summer”!) But with the bright colors, I’m bringing in my own summer sun!